A notable hit was the youthful Harry Secombe in pre-Goon days with his comic and straight singing, whose performance drew a good response from Princess Margaret. Continuing the relatively new concept of a 'warm-up' act was the Crazy Gang who, among other antics, dressed up as Beefeaters to greet the Royal Party on the stairs. Other star turns were radio stars Richard Murdoch and Kenneth Horne of 'Much Binding in the Marsh', the country's top woman impressionist Florence Desmond, and singer Carole Lynne (Lord Delfont's wife). The audience was in for a surprise this year when the Royal Party arrived, for along with the Queen and Princess Margaret were nurses Ruth Beswetherick and Doreen Pearce, who had been nursing King George VI through his recent illness. 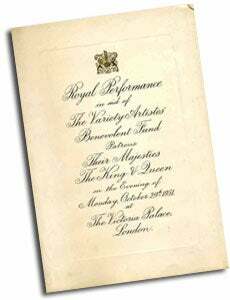 His Majesty was too ill to attend the Victoria Palace but as the Queen told an enquiring Bud Flanagan: "He is going on very nicely, thank you." And when told how sorry everyone was that His Majesty couldn't attend, the Queen replied, " So is he, but he is listening in." Richard Murdoch and Kenneth Horne appropriately sang, "We're very sorry someone isn't here today and here's a special message that we'd like the band to play" followed by "Here's a health unto His Majesty." The huge cast of three hundred caused problems at the Victoria Palace theatre, which was not big enough to accommodate them all. Frantic preparations were made to house nearly one hundred stars in separate theatres, and fleets of coaches were laid on to ferry artistes forward and back from various venues, some more than a mile away. The shortage of space in the dressing rooms proved to be of little inconvenience to Richard Murdoch who was able to turn the situation into new gags. On hearing that he would be sharing a room with five others , including Jimmy Edwards, Richard said, "I've made more room by not bringing my coat-hanger. I can hang my coat on Jimmy's moustache." The BBC also gave the surprise announcement that it would broadcast the last part of the show on the radio. 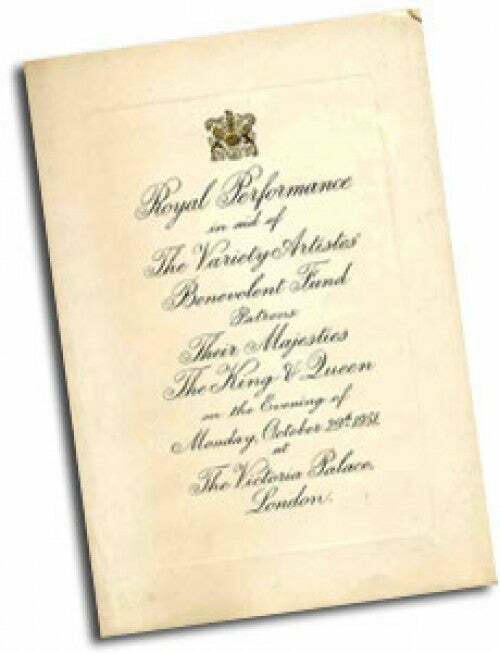 Therefore, instead of having one listener (the King was supposed to be tuned into a private broadcast), many millions had the pleasure of hearing the Royal Variety Show. Arthur English was the uncomfortable victim of pranksters during his turn. On looking for his prompt, he found that things were not as they should have been. "Half way through my turn I look at a precis of my jokes sewn to the back of my six-foot tie." he said afterwards, "but someone had changed the wording tonight. It flummoxed me for a second." Who could have been? Not the Crazy Gang, surely? 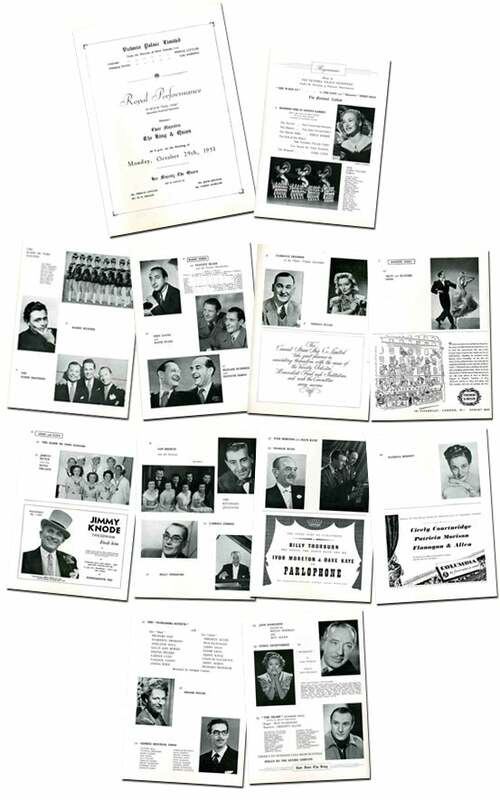 The Mary De Vere Dancers, Johnny Hutch And The Seven Volants, Sam Browne And His Singers, The Keyboard Quintette, Carroll Gibbons, Billy Thorburn, Ivor Moreton And Dave Kaye, Charlie Kunz, Patricia Morison.